Planning is well underway to create a new look Progressive Web App (PWA) for WordCamp events. The PWA will make accessing and providing content on mobile devices much easier for attendees and organisers. 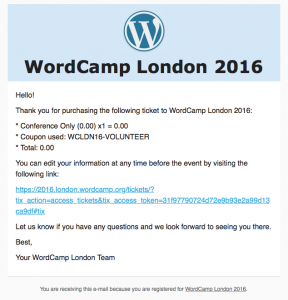 This builds on the work to create a PWA for previous WordCamp Europe (WCEU) events. However, rather than developing a standalone PWA at a separate URL to the WordCamp site, as has been the case in the previous years, the plan is to create a layer of contextual information for Camp attendees that is served from and integrated with the WordCamp website, and which can be stored locally on the user’s devices for offline access. The PWA will present a better mobile experience, taking advantage of touch screen gestures, and will put the most relevant information “at the fingertips” of Camp attendees. The PWA will enhance a WordCamp website, and will allow users to bookmark the website to their device’s home screen for offline access. This PWA functionality will initially be created as a plugin, displaying an additional visual ‘layer’ of content aimed specifically at attendees, in an ‘App like’ way over the main WordCamp website content. However, both online and offline users will have access to this same layer of content. The plugin should be simple to set up and configure, so that – in the longer term – any WordCamp event can take advantage of its features. 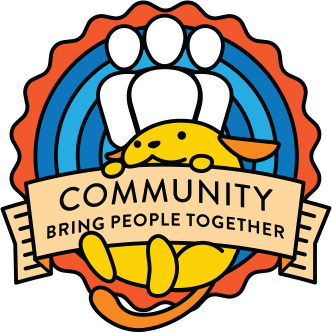 This initiative is being led by the WordCamp Europe 2019 Organiser teams, with design prototyping by the WCEU Design team and development by the Attendee Services team. The Communications team is also actively guiding the design and development of the PWA. The WordCamp PWA plugin will present an additional ‘layer’ of mobile friendly content over the main WordCamp website – inheriting the basic colours and fonts of the website. However, individual WordCamps should be able to customise the look of the PWA further using CSS overrides. This PWA layer can be switched on/off from plugin settings within WordPress admin, so that it is only available for the duration of the Camp. 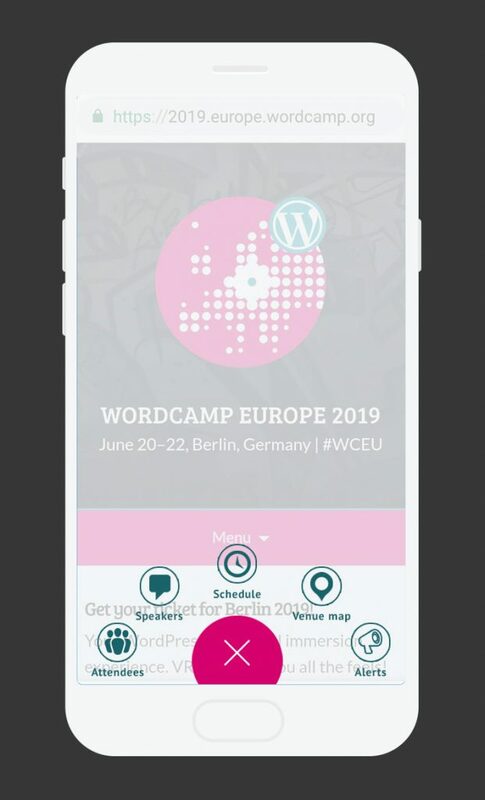 When viewing the site on touch screen devices during the Camp, users will see the PWA layer appearing over the top of the WordCamp site. The PWA controls will look very like a native smartphone App, and will be optimised for touch screen devices, employing swipe gestures. On loading the website on touch screen devices, the user would be presented with a range of PWA control, docked to the foot of the screen, offering PWA menu options as icons around a large, central, ‘always visible’ circular button that will be used to open/close the PWA layer. Using the power of PWA, the content of the App will be downloaded and stored offline on the user’s local device, and can be bookmarked on the user’s home screen to be accessed at any time, with or without an internet connection. Attendees: a full list of attenders with Gravatars, sorted alphabetically, with search field to look up attendees by name. For GDPR reasons, attendees should not be downloaded and stored offline on the local device – although this may be reviewed in the future in line with GDPR and privacy regulations and with any permissions requested during attendee sign-up. Speakers: a full list of speakers with Gravatar, biog and links to relevant sessions, sorted alphabetically, with options to filter by schedule date/topic group and search field to look up speakers by name. Schedule: a full schedule for the WordCamp, with a single column per schedule date, and option to filter by Track. Users will have the ability to ‘favourite’ sessions, and these preferences will be stored on the local device. 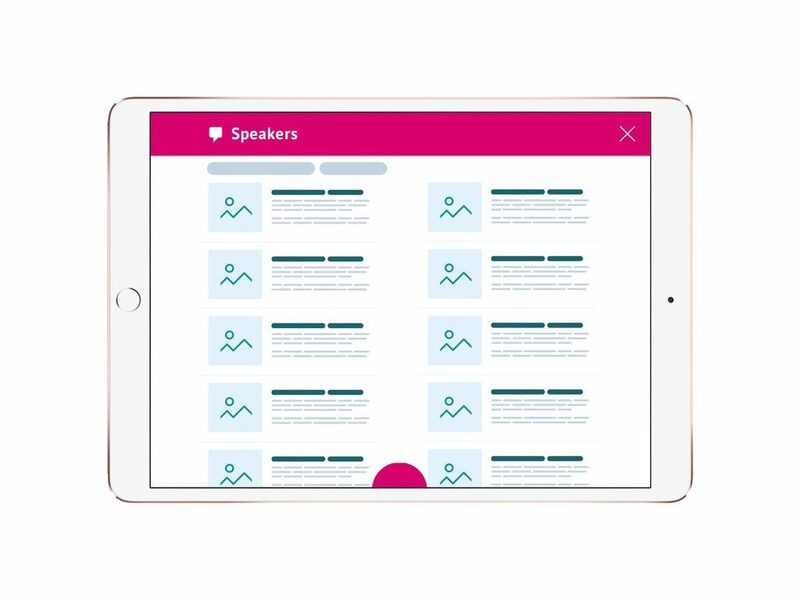 Columns can be swiped left/right to view previous/next day, and the sessions should be filterable to show just the sessions which the user has marked as their ‘favourite’. 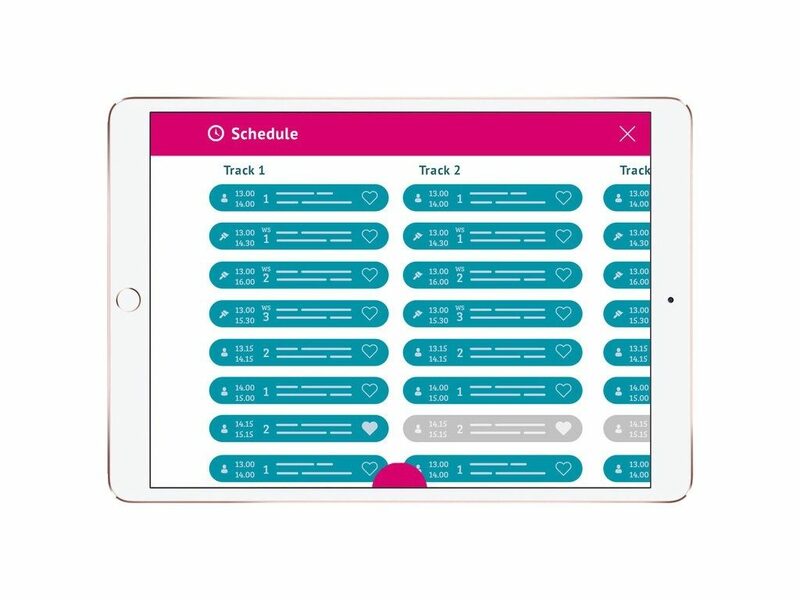 Depending on when the schedule is viewed, the schedule list should visibly scroll/animate down to the current time/session, so users can see ‘at a glance’ what is ‘on now’. Venue Map: one or more graphical floor plans of the venue, with the ability to swipe/pinch to resize and re-position the maps within the viewable area of the screen. Announcements: a chronological listing of announcements for attendees during the WordCamp, filterable by type (that is, catering, sessions, social, and so on) and can be determined by the WordCamp organisers. These five sections will be arranged as icons around a large central ‘Start’ button, docked to the bottom of the screen, to allow users to turn the PWA layer on/off. This circular arrangement would allow us to add additional buttons/sections at a later date, and have these icons ‘revolve’ around the main circular ‘Start’ button with swipe gestures. The content for all the above sections is already present with the WordPress database for WordCamp sites, apart from ‘Announcements’, which will need a new Custom Post Type to be added, potentially with its own custom taxonomy (to allow users to filter different types of announcements). Venue Map images may also require the use of one or more custom fields for storage and display. 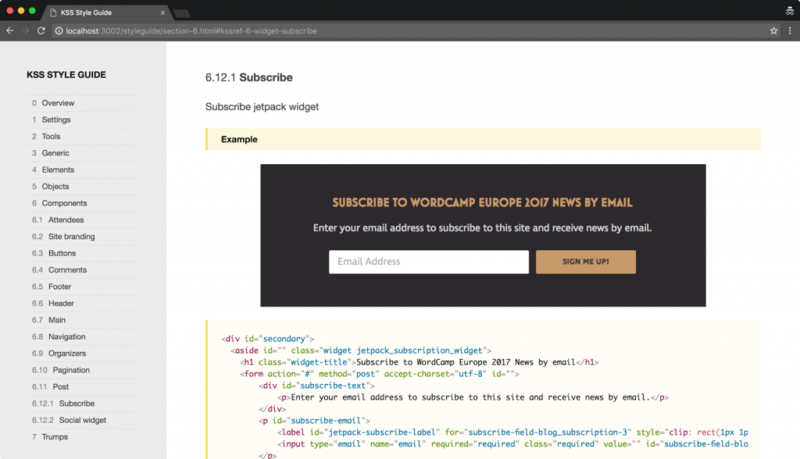 The ambition is to pilot a version of the WordCamp PWA plugin at WordCamp London in April 2019, followed by a full launch at WordCamp Europe 2019 in Berlin in June 2019. Would you use this PWA plugin for your WordCamp event? 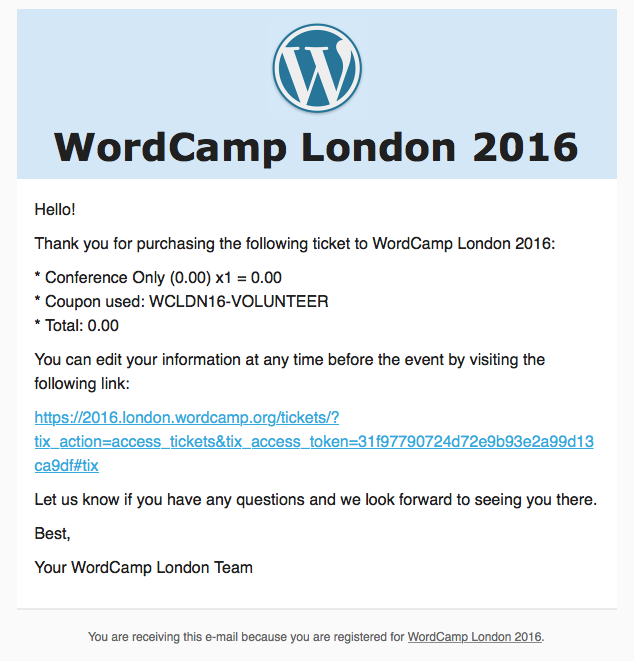 Is the content detailed above the most useful for WordCamp attendees – is anything missing or unnecessary? Is the design/UI proposed intuitive and accessible? Any other feedback or observations? After posting these original plans to enhance WordCamp websites with Progressive elements, we received a lot of feedback and suggestions to enhance this development work. Thank you! Based on this feedback, we now intend to take a more integrated approach to the project. In practical terms, this will build on the great work of Weston Ruter and his Progressive Web App feature plugin, which brings PWA capabilities – including service workers and the web app manifest – to WordPress. This will mean that, rather than create a new and separate “layer” of context based information “over” the WordCamp website, we will instead allow key pages of an existing WordCamp site to be stored locally on a user’s device for offline access. In addition, we would intend to create a new homepage for the website for the duration of the WordCamp to display context based content on the Sessions that are “on now” and “up next”, alongside the latest Posts from the Camp website, to put this key information at the fingertips of attendees. We intend to complete this work in time for WCEU2019. Beyond that, we hope that this enhancement to WordCamp websites would be available to WordCamps around the globe. The last two WordCamps I had the pleasure to visit asked speakers to sign the A/V release form on a pdf file. This means having a printer and a scanner (or if you are more tech savvy and you have a Mac use Preview, but I don’t assume everyone knows that – I didn’t up until a few days ago!). Checkbox (redundant, cause if you didn’t send the form for us it meant you didn’t sign the form, but we felt it reinforced the importance of explicitly approve the rules). I feel that this would make the process easier for speakers. Do you think we could create this page for all WordCamp.org installations? 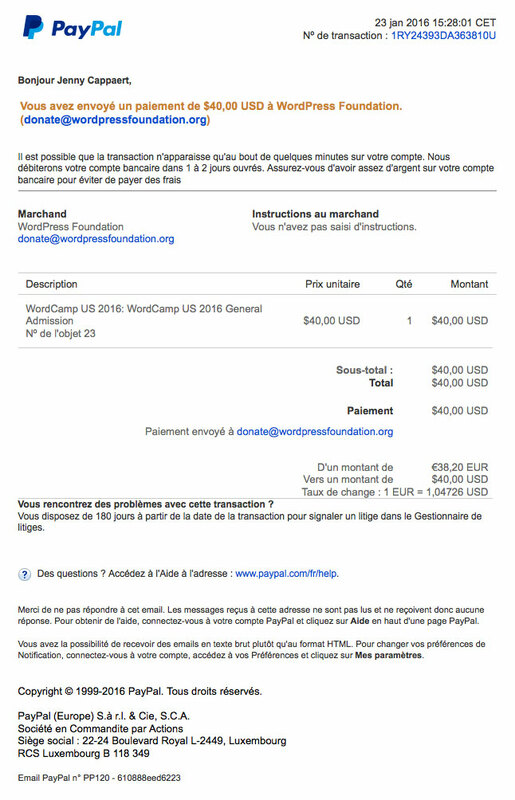 I consider myself to have pretty high tolerance for monotonous, “mindless” tasks, but after taking on ticket invoicing for 3 consecutive WordCamps (Paris, London, Europe), I must re-evaluate. Some mindless manual tasks are still necessary (folding laundry), but as software engineers, our mission is to make life easier by automating as many such tasks as possible, right? 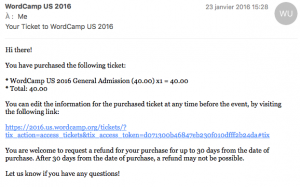 When an attendee purchases a ticket to a WordCamp, they do not receive an invoice. For many attendees this is not a problem, but for businesses and/or employees looking to declare their expenses or get reimbursed, they need proper, standardized documentation. The full name and postal address of the issuer (the Foundation). The full name and postal address of the purchaser. The VAT number of the purchaser where applicable/if needed. The word “invoice” and sequential numbering (invoice #001, …). The date of issue (if different). The name of the product (type of ticket). The total price of purchase. An email confirmation sent by the website. The name and email address of the recipient. The currency of purchase (and exchange rate). *VAT (Value added tax) is an issue in and of itself. I’d like to set the VAT question aside for the purpose of this post and the question of automating ticket invoicing. As it is, manual invoices do not include VAT, but rather the VAT line in the total reads, 0. I do believe these to be two important, but separate, problems. As we already have these two supports available, it would seem logical/relatively easy to build on them. 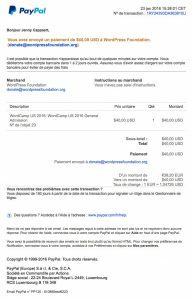 The full name and postal address of the WordPress Foundation. The word “invoice” (internationalized), followed by sequential numbering based on the post ID (or something along these lines) of the ticket purchased. Add the VAT line to the total, to read 0 (until that separate and local problem/question can be addressed). Could we imagine the possibility of adding custom fields to the email templates? This would allow us to use custom fields to include optional company and tax information for purchasers. I’ve seen this work in the WooCommerce extension WooCommerce Checkout Field Editor, and although the interface is a bit different, the actions/results are the same. And ideally, as a next step, and as would be great to see for Sponsors invoices as well (! ), the possibility to generate an invoice (email and/or PDF) directly from the Admin would be a huge bonus (because emails invariably get lost/discarded). In talking with @paolo about my fantastic custom fields idea, he mentioned that PayPal should have the capability to send invoices for us. I went poking around a bit, and mostly came up with information about sending invoices for payment, not as receipt of payment. These may seem like small numbers considering the total number of attendees for each event, 500, 660 and 2200 respectively. But what these numbers don’t show is the time also spent in communicating with attendees who request these invoices, the time it takes to look up the ticket and make sure it was purchased (yes, not all requests are attached to actual tickets), discrepancies when the asker is not the purchaser, the number of back and forths to explain that the postal address is needed but that the invoice will be sent by email, etc. Sometimes several people can be involved if the request goes first to Central before making its way to appropriate parties, managing email inboxes, etc. London helped the process along by creating an online form for requests and a spreadsheet to manage them. But in the end it was still a couple hours of work to verify, issue and send each requested invoice. Automating this process would collectively save us volunteers huge amounts of precious time. I’m convinced that updating our email confirmation templates would be a fast and direct solution. 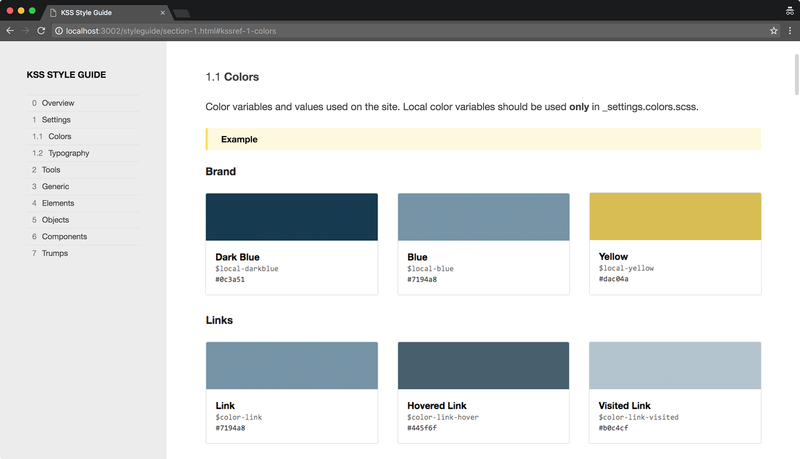 I also think there is inspiration (and code) to be found in existing WooCommerce solutions (templates, extensions). Hi Everyone, I have an idea for the WordCamp websites relating to the new Session Slide Link functionality. I posted some questions in Slack starting at https://wordpress.slack.com/archives/outreach/p1465885292000003 and Ian said to post here. Essentially I would like a shortcode that only included the Session Time, Title, Speaker and Link to slide. So no long session description that currently happens with `[sessions show_meta=”true”]`. Either added to the `[sessions]` one or if `slide_link=”true”` was added to the `[schedule]` shortcode. A visual of what I’m wanting to accomplish is on https://2016.kansascity.wordcamp.org/presentation-slides/. My reasoning is that when the schedule is printed in the name badge, attendees circle/mark which sessions they go to on the badge. When they go to look for the link later, having it somewhat be in the same place will make it easier to find then a long list of Session titles. Anyone else think this would be a good idea and/or could code it? Promotions isn’t really the right word, but I wanted something with the same excitement as announcements for Commit Access get on core. Brandon Dove (@brandondove) and Kevin Cristiano (@kcristiano) have been powerhouse deputies since the program began, and their dedicated volunteerism deserves thanks from us all. While we work out how to improve our processes and as we grow the community team with more deputies, we’ll be working within the (sometimes kludgey) systems we have. One of the bottlenecks for deputies has been that sending out organizer agreements and setting up new WordCamp sites was limited to Cami and Josepha. Brandon and Kevin now also have these abilities to help speed along the process of approving WordCamps. Hopefully we will be adding more people and/or changing the way this process works so that it can be automated on approval, but for now, yay — instead of only 2 people there are 6 (because also Andrea and I are back). Thank you again, Brandon and Kevin, and may you send many exciting organizer agreements and set up many default sites as the future unfolds!